Shares of Raytheon (NYSE:RTN) fell 12.5% in December, according to data provided by S&P Global Market Intelligence, on mounting evidence that suggests lawmakers in Washington will struggle to agree on a fiscal 2020 budget. This is a good stock for the long haul, but investors should expect further turbulence in the months to come. 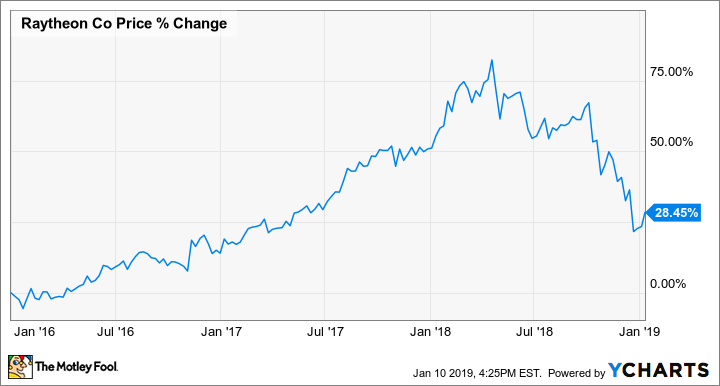 Raytheon and other defense stocks were among the big winners of the last few years, with Raytheon shares up nearly 75% from the beginning of 2016 through the first quarter of 2018. That rally was fueled by optimism surrounding single-party control in Washington, and investors were rewarded when lawmakers agreed to a two-year budget deal that lifted caps on Pentagon spending. RTN three-year chart, data by YCharts. I warned in October that the U.S. midterms could cause declines, and in December, investors saw firsthand how political dynamics can impact stocks like Raytheon. Investors were rattled by the surprise mid-month resignation of Defense Secretary James Mattis. And a partial government shutdown that began late in the month after the White House and Congress were unable to agree on a spending plan raised the level of concern that the two sides will not be able to come together in early 2019 to forge a deal on a fiscal 2020 budget. Absent a deal, caps would return, and the Pentagon would have to cut its spending by upwards of $100 billion. Shares of Raytheon and other defense titans are likely to whipsaw in the months to come as the highly public budget negotiation plays out in Washington. But for long-term investors who can block out the headlines, this company is a solid investment. Raytheon is unique among the defense primes in that it doesn't make the massive warships, tanks, or planes most closely associated with government contractors, but instead specializes in missiles, missile defense, and the electronics and sensors that make those armaments lethal. Raytheon's Patriot missile in action. Image source: Raytheon. Raytheon also generates about 30% of its revenue internationally, tops among defense contractors, which provides it a better buffer than most when it comes to weathering political infighting and budget cuts. Its Patriot air defense missile system is deployed with a growing number of U.S. allies. I can't say for sure that Raytheon's shares won't fall further in the months to come or predict how quickly they might recover. But for long-term investors, Raytheon's diverse portfolio of products and broad customer base make it an attractive addition to the portfolio. Check out the latest Raytheon earnings call transcript.